A new study determined the habitat requirements for flying squirrels and compared them to those included in the recently amended Forest Act. The main finding was that the Finnish Nature Conservation Act does not adequately protect the old growth forests where flying squirrels live. Unsustainable use of forest resources is a global threat to biodiversity. This threat is particularly rampant in the boreal zone where coniferous forests are subject to intensive forestry. The recently published study focused on the flying squirrel, a typical example of a species suffering from modern intensive forest management based on clear-cutting practices. The flying squirrel is also protected by the Habitats Directive of the European Union. 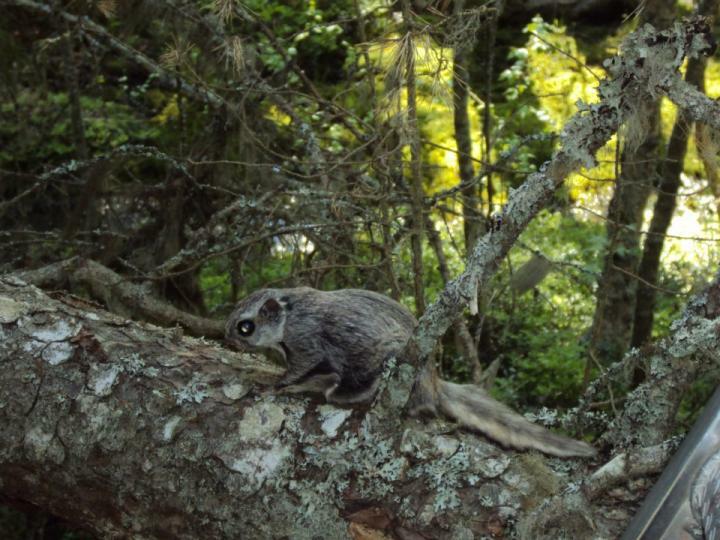 "Preserving habitats for flying squirrels simultaneously preserves a diverse forest ecosystem in its entirety," says Ralf Wistbacka, a doctoral student at the University of Oulu. Legislation is among the most important tools for conserving nature. For legislation to be effective and generally accepted, it should be based on scientific evidence. This is particularly crucial for environmental legislation, such as the Finnish Nature Conservation Act and the Forest Act that regulate and restrict the use and management of private forests. The recent study evaluated the legislation guidelines that aim to preserve the habitat where flying squirrels live. The species inhabits old growth forests threatened by extensive clear-cutting. The occurrence of female flying squirrels was monitored for twelve years at 81 locations. The researchers modelled the occurrence of female flying squirrels in certain habitats. They then compared the amount of forest that females' require with that that would be preserved if current legislation, recent amendments included, were to be followed. The comparison indicated that both the initially proposed and the amended official guidelines would safeguard suitable habitat for the squirrel only to a very limited degree, resulting in an extremely low occurrence of female flying squirrels (less than 5%). In other words, both the current Nature Conservation Act and the proposed governmental guidelines cannot adequately safeguard the occurrence of flying squirrels. The amendment suggestions to current management guidelines concerning forests inhabited by flying squirrels are not based on scientific evidence, nor do they improve the protection of the species to any measurable extent. The results of the recently completed study shed light on the large gap between science and policy, which in terms of environmental legislation seems particularly wide. "We must work hard to fill the gap between science and policy to ensure the preservation of biodiversity in a rapidly changing world," says Andrea Santangeli, a researcher at the Finnish Museum of Natural History LUOMUS, part of the University of Helsinki. The newly published study was carried out in collaboration between researchers at the University of Oulu and the University of Helsinki.